Posted by Lorea Thomson on Tuesday, April 18th, 2017 at 11:43pm. 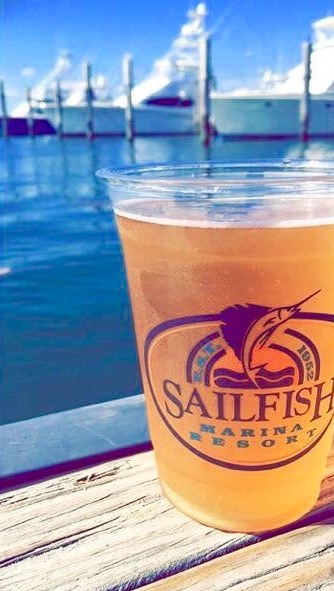 Enjoy live music at the Sunset Celebration at the Sailfish Marina. Clark Rodriguez, a well-known local musician, plays Jimmy Buffet style music. Jimmy Buffet tunes and/or steel drums playing on the boardwalk is a regular Thursday occurrence as the sun sets vividly in the sky. Spot lazy pelicans bobbing around in the water hopping to catch a scrap of fish food. You can buy fish food from the ship’s store and toss it to the fish eagerly waiting at the docks. On any Thursday evening, you may find wood sculpture, pottery, watercolors, blown glass, gold and silver jewelry and much, more. Many vendors come from, as far away, as Seattle, WA to the Sailfish Marina Resort. Sailfish offers a classic South Florida setting of fresh seafood restaurant and yachting marina. The restaurant is on the Intracoastal Waterway, north of the Lake Worth inlet and a bit north of Palm Beach. Come by boat, car and just sit back and watch all the boats cruise by. Indulge in a sit down dining experience or grab a famous “Grouper Dogs” or an enjoyable basket of Conch Fritters! It is reminiscent of a lazy Key West night. Wander around the marina, enjoy the music, art and beautiful spring weather. You are sure to find a relaxing and rejuvenating evening here. The Sunset Celebration is the perfect showcase to what life on Singer Island is like. Stop by on any Thursday evening and bring the family pet on a lease and feed the fish off the docks! It’s a spectacular night.